The blood samples were taken during research into grounding by Dr Stephen Sinatra MD. The video clip on the right shows the results of some similar blood tests which were performed on some volunteers live during the Longevity Now Conference 2010. Presented by David Wolfe. 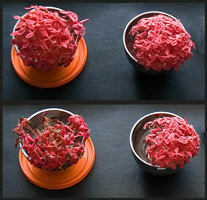 The image on the right shows a fascinating experiment on the effects of Grounding flowers.